I would like to thank you all for holding my family up in prayer this past year. I know it has been the only reason that we have continued to recover and start to move forward. TEAMS encouraged me to hold off on any life-changing decisions for a year. That was very wise advice, as looking back I see that rational thought did not always prevail, and that decisions made in the attempt to escape unrelenting grief are often not best for the long term. As the year anniversary approached, we explored ways that I could remain with TEAMS in a useful ministry function. 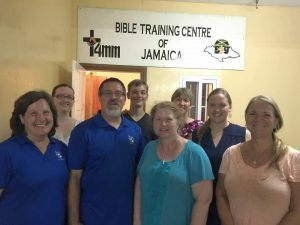 I visited Jamaica multiple times in the past year, meeting with the Bible Training Centre of Jamaica leadership team. We have hired a Jamaican pastor and BTCJ instructor, Paul Hemmings, as Director of BTCJ, and he is doing an excellent job at maintaining and growing the school. The entire leadership team has pledged to build on the foundation laid during our stay there. Randy’s vision is in good hands with Paul and John Heater. I did not feel that at this stage, I could add enough value to continue as a missionary with TEAMS. As I pondered in what way God would have me serve Him now, I was drawn to investigate if my skills could be more directly used in missions. I worked as a computer programmer for many years before leaving the country, and wondered if there was a need for programmers in missions. It turns out that mission agencies have many, many openings for IT skills and several were actively searching for software developers. After discussions with three mission agencies, I have applied with Wycliffe Bible Translators. For more than 70 years, Wycliffe has helped people around the world translate the Bible into their heart language. They also help with language development, literacy and other spiritual and physical needs. They are dedicated to working to complete the Great Commission, and I am very excited and honored to have the chance to work on the translation software tools that every translator in Wycliffe uses (with over 1000 active translations happening now!). Amy and Tyler are still struggling to sell their house in Lincoln, Nebraska. They are replacing the roof this month and fixing some other issues and it will go back on the market soon. Please pray that this investment will earn them a quick sale after completion. Cassi and Max are expecting my first grandchild in December. Pray for an uneventful pregnancy and healthy baby! Kali returns from Nepal this week! She is praying about her next steps in her education/missions journey. Please join her in praying for wisdom and clarity. Anna is headed to Iowa State University this fall to major in engineering. On the advice of several missions mobilizers, she has adjusted her major to better facilitate entry into a “closed to missionaries“ country. Her goal is to help bring the gospel to an unreached people group. TJ turned 16 this summer and is training as a server at the local IHOP. He is also dedicating his summer to training the puppy we got for our birthdays! I am well into the application process with Wycliffe, and we expect the paperwork to be finalized around August 1. I will let you know as details are finalized and transition plans are made. If you have questions, contact me at sara@t4mm.org. I will be available for church/small group visits soon – contact me if I can share with your group! I appreciate the TEAMS family support this past 6 years of ministry and especially, of course, this past year. I’m looking forward to watching God continue to move mightily in Jamaica through the TEAMS ministries. God’s faithfulness has been proven over and over as we navigate the changes of life and ministry.